Madagascar is an island off the coast of Africa famed as the land of Lemurs. Madagascar's geography features rainforests, lakes, thermal springs, tea plantations, canyons and spectacular desert landscapes marked by mammoth baobab trees. 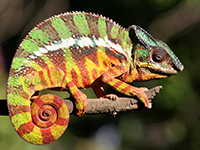 Home to endangered lemurs, vibrant frogs and reptiles, massive whales and beautiful birds, Madagascar is at times called the ‘Eighth Continent’ owing to its rich biodiversity. The island’s history dates back to two thousand years ago when Indonesian/African people settled in from the mainland and created a unique Malagasy culture over the years. A visit to the historic cities of Antananarivo, Antsirabe and Ambalavao will give visitors an opportunity to indulge in this unique culture. Other popular things to do on a Madagascar tour include trekking through forests and indulging in some rest & relaxation at the beach resort of Toliara.